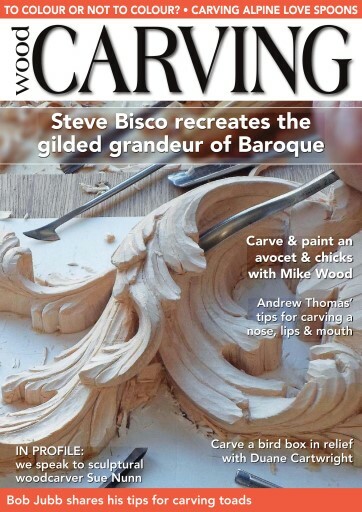 Issue 146 of Woodcarving magazine is filled with a host of great articles for you. 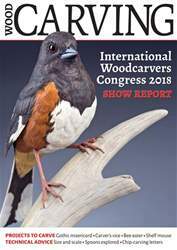 We have Steve Bisco recreating a grape and acanthus garland; Duane Cartwright carves a bird box in relief and Mike Wood shows us how to carve an avocet and a pair of chicks. 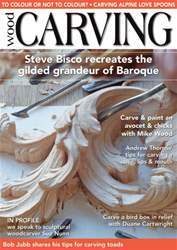 In ‘Features’, we speak to sculptural woodcarver Sue Nunn and in Art of Carving, we look at the Konark Sun Temple. 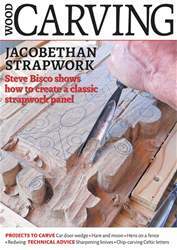 We have some great ‘Techniques’ articles for you too, including Andrew Thomas’ carved nose, lips and mouth; David Western takes a look at the Alpine tradition in spoon carving; Andrew Hibberd explains how to create a block print; Bob Jubb shares his tips for carving toads; Peter Benson discusses the topic of adding colour to your carvings and Mike Chambers discusses his techniques for carving a realistic tree in relief. We also have our usual ‘Carver’s Toolbag’ and our ‘Community’ pages, featuring ‘Leader’ from the Editor, ‘Round & About’ as well as a peek at our next issue. 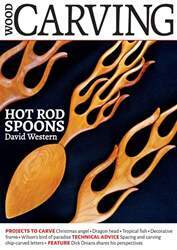 All this and more in Woodcarving issue 146!